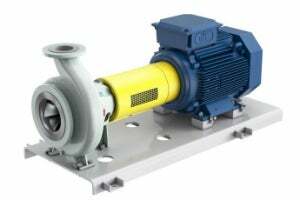 Sulzer has launched the new innovative SNS end suction single-stage process pump range. MEI, the minimum efficiency index for standardised water pumps, was set up to be =0.4. This means that 40% of the pumps currently on the market do not comply. Only the pumps and motors which satisfy the energy-efficiency requirements of the EU’s ErP Directive may be sold. The SNS process pump range not only meets the criteria, but breaks all records by exceeding the MEI 0.7 requirements.